My wife found this really cool MODIS picture of the great lakes dumping mounds of global warming in our back yard. From this article in mlive. This entry was posted on January 8, 2015 at 8:38 pm	and is filed under Uncategorized. You can follow any responses to this entry through the RSS 2.0 feed. You can leave a response, or trackback from your own site. Impressive image! From size and volume are the Great Lakes a drop of the size and volume of the world oceans. Very cool picture indeed Jeff. Having lived in the area most of my life, the lake effect snow can make life pretty interesting. We were trapped on a backroad during deer season and because the snow comes in striated bands of cloud (visible in the image) every 10 -15 minutes it was hard snow followed by starry sky. Beautiful image. It is interesting to see the mechanics of how peninsular Michigan gets such exciting winter weather. Explaining (extract): Cloud streets are long parallel bands of cumulus clouds that form when cold air blows over warmer waters and a warmer air layer (temperature inversion) rests over the top of both. The comparatively warm water gives up heat and moisture to the cold air above, and columns of heated air called thermals naturally rise through the atmosphere. Thanks. Am now subscribing to the NASA service for more of these excellent photos and reports. Cause we aren’t idiots Doug. The Climate debate exposed, and it is now time to relax and enjoy this classical re-enactment of a play featuring Big Brother’s conflict with Reality ! 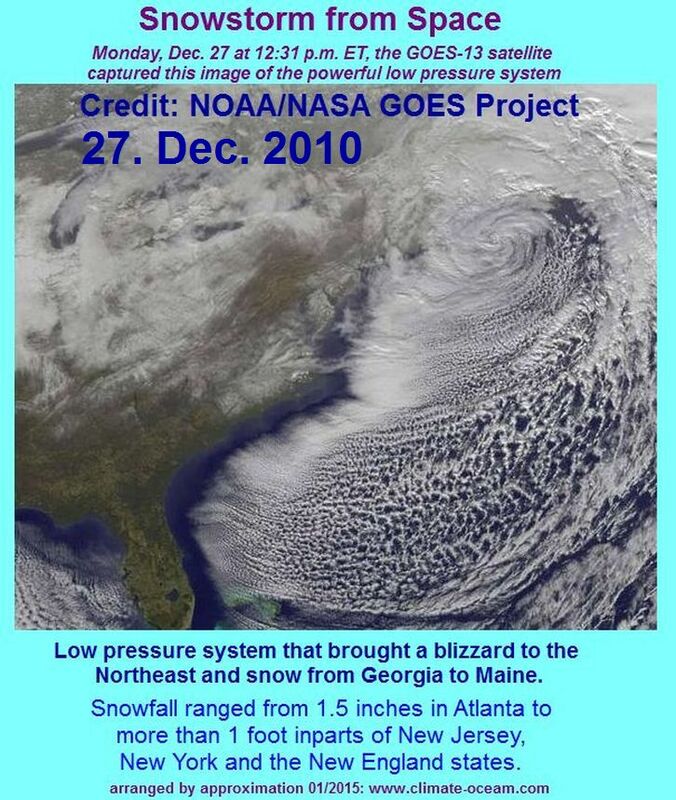 The “lake effect” the other way around. 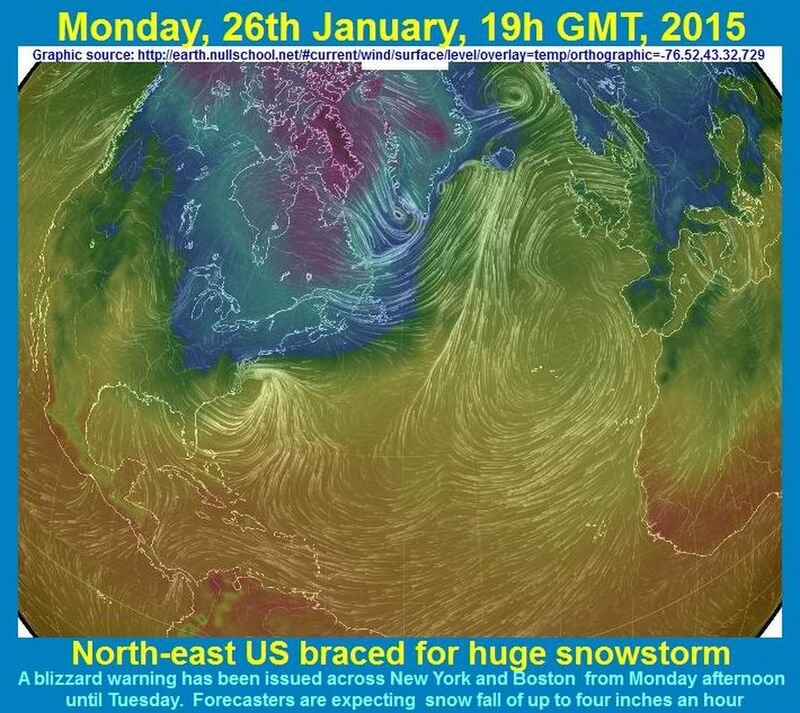 potential for blizzard conditions and more than 2 feet of snow. Naming winter weather is such a bunch of bs. It is long past time to push back at the hypesters. Stephen Wilde is currentlyl promulgating his invalid physics all over various climate blogs. His “rising and falling parcels of air” are not contributing any new energy at all. We all know if you throw a stone into the air it does not return with more kinetic energy than you imparted to it. All Stephen’s conjectures tell us is that the atmosphere slows non-radiative surface cooling by non-radiative processes, as it also slows radiative cooling by radiation to the surface. We all know that happens, because we know Earth’s surface does not cool anywhere near as fast or as much as the Moon’s surface. So what, Stephen Wilde? Cooling from what temperature? You have not explained how the required thermal energy gets into the surface in the first place. The mean solar radiation of 168W/m^2 does not supply anywhere near sufficient. How do planetary surfaces get hot in the first place? The temperature will not build up above what radiation could achieve except by the addition of extra thermal energy by non-radiative processes. If the extra energy is supplied by radiation only, it will just be radiated away. There has to be more energy supplied than radiation can emit, because there are other energy losses too, like conduction, convection and evaporative cooling. The Sun’s direct radiation into the surface does not have a hope of raising the surface temperature of planets with atmospheres to the observed levels, and such surfaces are not black bodies (by definition) and so need even more radiation than a black body would, because they simultaneously lose energy by non-radiative processes as well as by radiation. Even James Hansen and Co. realized there was missing energy, and so they worked out that they needed as much again as the Sun supplied at TOA. Hence the whopping 100% back radiation figure that (by coincidence? /sarc) gives a net energy input of just over 390W/m^2 which nicely agrees with a black body temperature of 288K (15°C) all well fiddled into place. The only trouble is that the back radiation component does not penetrate the ocean surfaces that make up about 70% of the globe. So, Stephen Wilde, your little thought experiment that shows nothing more than that the atmosphere slows non-radiative surface cooling, is nothing new and in no way a complete explanation as to what happens regarding energy flows on all planets and satellite moons with atmospheres..
Well, if the icebergs from the poles are melting, in a few years the global sea level will rise about 20 feet so, the small lakes will become rivers. After that, planet Earth might start the Ice Age in order to stop our industry and to take us back in the stone age when the CO2 emission were almost zero. There are so many scientific things wrong with your comment and link it is nearly impossible to start. Icebergs aren’t melting first but if they were, it would not increase sea level. If the sea level rose 20 ft or so nothing appreciable would happen to the habitability of Earth as a whole, although some areas would have to move. The link is completely crazy bio-doom bs. Pray on, perhaps the gaian god will make it all true.